Love succulents but have a hard time keeping plants of any variety alive? 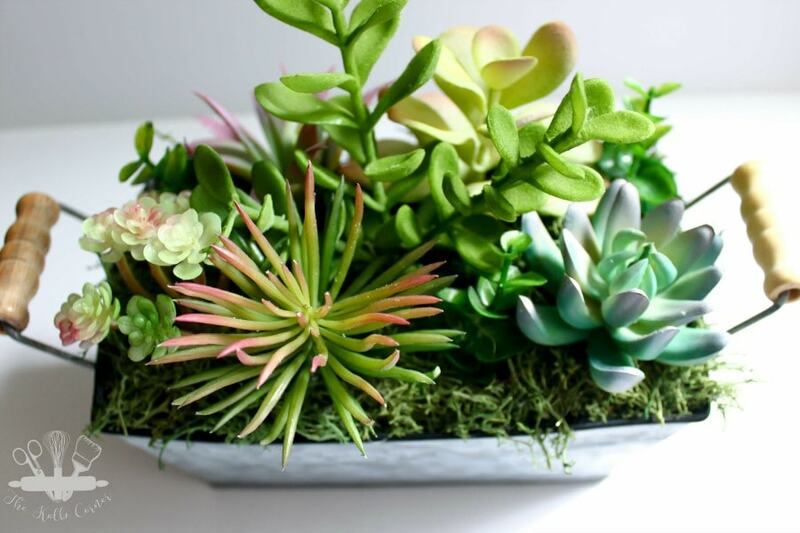 Check out this faux succulent planter that you can make yourself. The best part is it’s black-thumb proof! I took a bit of a break this week on Spring cleaning and organizing my home while my mom was in town visiting for Easter. I’ll be back next week with more organizing posts! While my mom was visiting, we walked around the San Antonio Botanical Gardens. There was so much in bloom!! Probably my favorite part was the succulent garden. 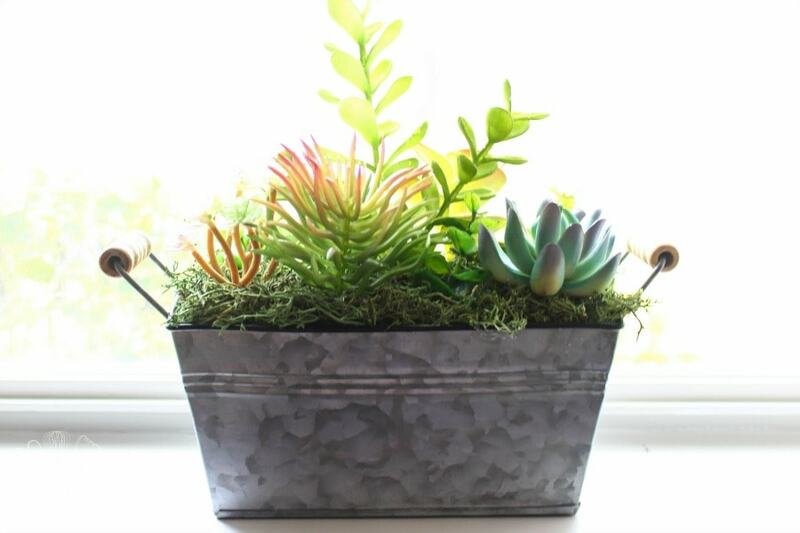 I have a slight obsession with succulents and have been wanting to create my own cute planter for inside. I have a few planted outside, but I don’t have to worry about them dying here in Texas. If I had live ones inside, they may not do as well, since I tend to kill indoor plants. 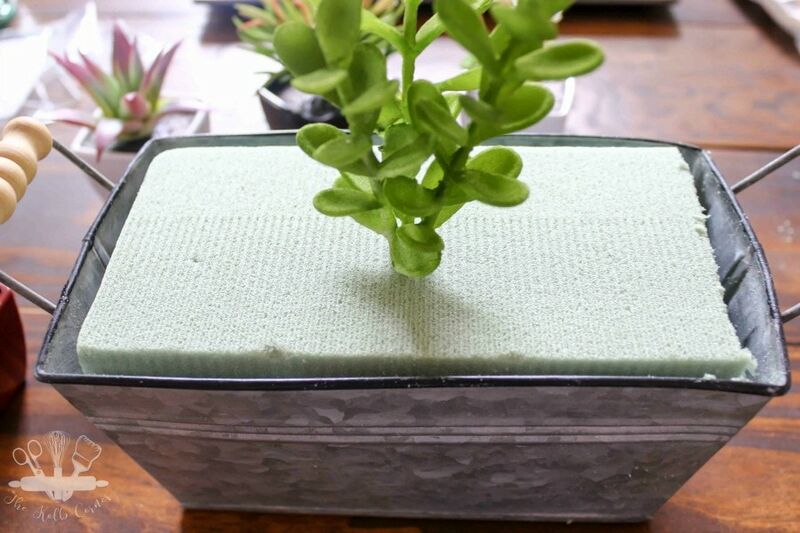 When I saw these faux succulents at Dollar Tree, I knew I could make a DIY faux succulent planter that I wouldn’t have to worry about killing in the house. Plus at $1 a piece, the price didn’t break the bank! Then I found the perfect little bucket at Hobby Lobby and the idea was solidified! 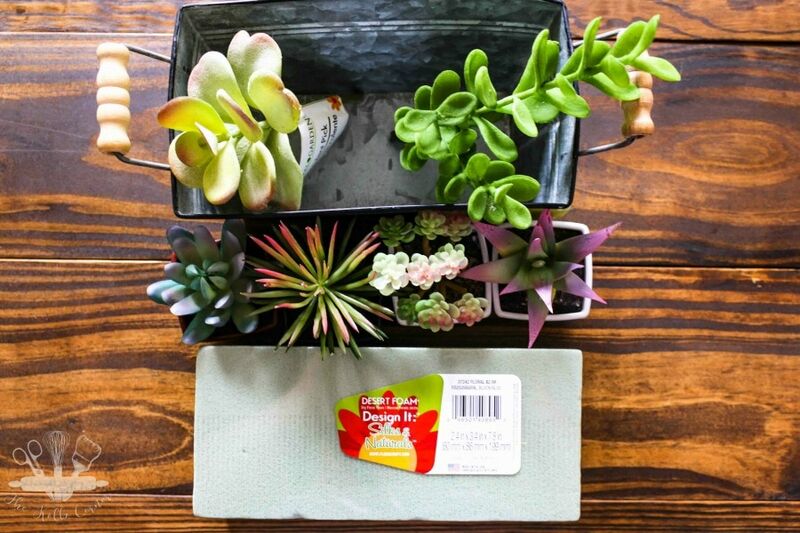 Succulent stems –Mine came from Dollar Tree but amazon has some great choices! 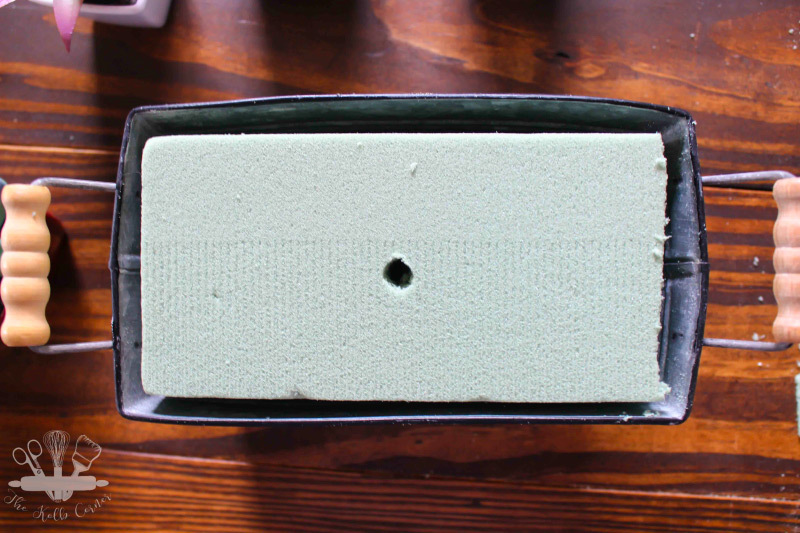 Start by cutting floral foam to the size of the metal container. 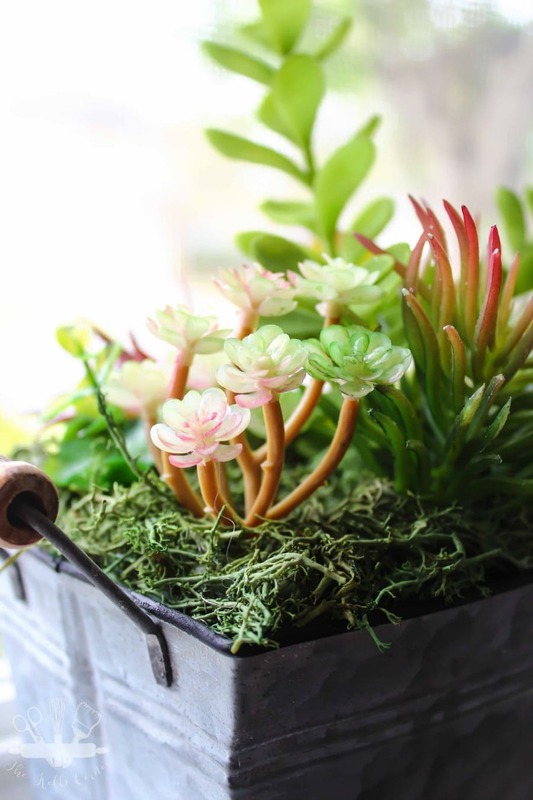 Next, decide on placement of the succulent stems. Simply push them down into the foam. After the succulents are in place, glue on moss to cover the foam using the hot glue gun. You could use decorative rocks instead. This was so easy to make and I can’t believe how beautiful it turned out. My obsession with succulents makes me want to make about 10 more of these! Ugh, I am so bad at keeping plants alive that I need to do this! Super cute! Me too! If they are inside, they die. Outside plants I can do! Amanda, I love your planter! 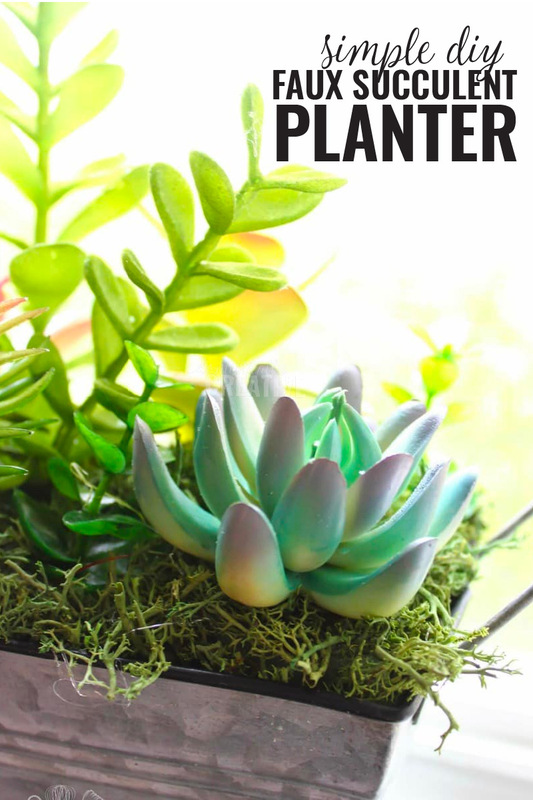 It’s perfect for someone who forgets to water their plants. Monday is my plant watering day and I forgot this week!! Eeek! 🙂 Have a fabulous rest of the week! Thanks Christie! It’s nice to have some “greenery” in the house but not something extra to keep alive! I love this! 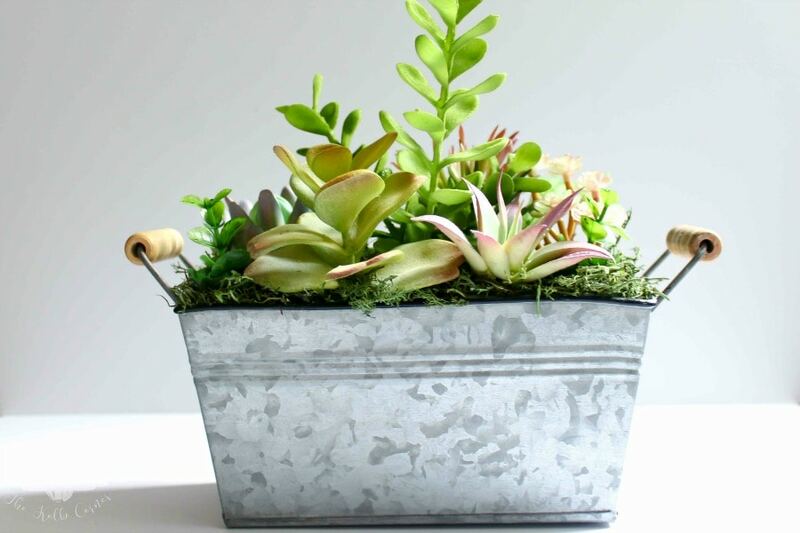 I have some metal planters like this, but they don’t drain, so this will be perfect!. I have never been able to keep succulents alive. I either overwater or underwater. Your arrangement looks so cute. 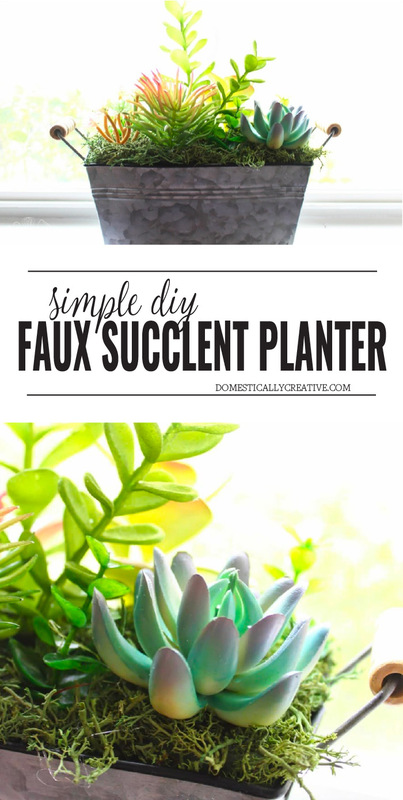 I might need to try faux succulents. Yes I am the same way with real succulents! Thank you so much for stopping by! This is so cute. 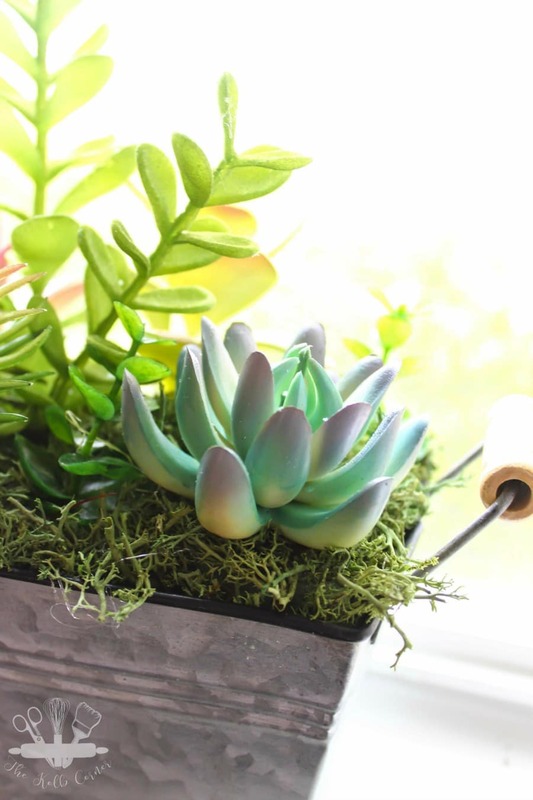 I love how realistic faux succulents look because I love succulents, real or fake! I need to make one of these. This looks great, Amanda. I’m terrible at keeping house plants alive, so this is a wonderful alternative. Thanks for sharing at Brag About It. I’ll be featuring this at this week’s party. This is so great! It is feeding my current succulent obsession! I do love how versatile succulents are. I made a wreath of them once! Love your planters. They are so pretty. Sharing. 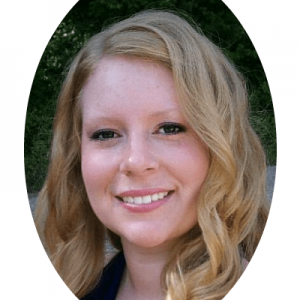 Thank you for being a part of the Hearth and Soul Link Party, Amanda. I hope you are having a lovely week!